My inbox saw a flurry of emails 4 January 2018 to inform me that ducted turbine darling SheerWind-Invelox was bankrupt. While the event wasn't much of a surprise, it did take much longer than I'd expected. While the web site is still live, there has been no activity since August 2017. SheerWind's phone has been disconnected. 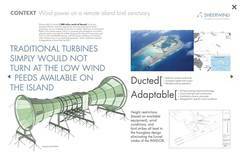 In February 2017 I asked Is the End Nigh for Another Ducted Turbine? So, no, I wasn't prescient. I thought they'd be gone by mid-summer when they would fail to meet their contractual obligations to the Michigan National Guard. It's one thing to stiff the Nature Conservancy, but it's quite something else to stiff people with an arsenal of weapons. Yet it is now official. SheerWind-Invelox is bankrupt with a Chapter 7 filing 29 December 2017. SheerWind will be liquidated. It has zero assets, and liabilities of $3.7 million. Ouch. There's not even a claim of intellectual assets for a device once labeled “industry-changing,” “revolutionary,” and the "new face of wind power." Even Sierra Magazine, the official house organ of the Sierra Club, hyped the device in a spring 2013 article by David Ferris for the Club's Beyond Coal Campaign. There's nothing on SheerWind's demise from the so-called tech press. MIT's Technology Review is silent as is Windpower Engineering that once touted SheerWind as "bird safe". Relative to the Ogin-FloDesign ducted turbine disaster, SheerWind-Invelox's bankruptcy is small potatoes. The $3.7 million in liabilities left by SheerWind is probably only one-tenth that lost on Ogin-FloDesign, a onetime Boston beltway tech wonder. Disclosure: I suggested on an electronic forum in August 2014 that heads should roll at the Nature Conservancy for the damaging hype they fostered and for the funds they squandered on the SheerWind-Invelox device--funds that could have been used to protect land and wildlife. SheerWind's liabilities likely don't include the removal of its derelict devices in Minnesota, Michigan, and on Palmyra Atoll in the equatorial Pacific. One of the devices--I don't call them wind turbines--stands forlornly near Chaska, Minnesota. Three of the devices are abandoned at two bases of the Michigan National Guard. One also remains on the Pacific atoll. In a quick Google search I found no further information on a SheerWind device in Iran or the monstrous version once under construction in China. Videos of SheerWind's inventor, Daryoush Allaei, extolling a device in his native Iran could be found on line in early 2017. In the grand scheme of things, SheerWind-Invelox's collapse is hardly worthy of note. The wind industry is a multi-billion dollar business with the likes of GE, Siemens, Vestas, and China's Goldwind churning out tens of thousands of wind turbines annually. These are wind turbines that work. Regardless of this fact, the press habitually goes gaga when some charlatan steps forward with a "device" that won't kill birds and will produce electricity "too cheap to meter." Then an ignorant or malign politician--and ignorance is epidemic among American politicians today--will point and say, "Let's use these things instead." What they don't add, of course, is let's use these things instead of real windmills that work because we don't want to rock the boat with the incumbent fossil-fuel and nuclear industries. Worse, these ducted-turbine hustlers work their magic on environmental groups like the Sierra Club, the Nature Conservancy, and once-admired public figures like Vice President Al Gore. Then they disappear and we're left to pick up the pieces--to remove their junk from the landscape--or from a remote atoll as the case may be. Because of the unfortunate interest in this company and its "device," I've devoted a special place on my web site for it: Sheerwind-Invelox. I've done the same for other such devices, including FloDesign-Ogin. Palmyra Atoll is administered by the US Fish & Wildlife Service as a wildlife refuge on American soil. The Nature Conservancy owns the atoll's Cooper Island and ten other parcels, including the only air strip. The Nature Conservancy manages its parcels as a nature reserve. Fish & Wildlife's Stefan Kropidlowski said that the SheerWind device on the atoll is the property of the Nature Conservancy and they are responsible for it. The Nature Conservancy has not responded to my request for comment on their abandoned SheerWind device. If the Nature Conservancy doesn't dismantle and remove the device from the atoll 1,000 miles south of Hawaii, the device will join other debris left on the islands from the US Navy's occupation between 1939 and 1959. In early 2017 the Nature Conservancy said that the device generated "some electricity". They never explained what they meant by that expression. SheerWind installed two of its devices at the Guard's Camp Grayling, and one very odd device at the Guard's Camp Custer. Michigan National Guard's Brigadier General Mike Stone said he was, "disappointed," by SheerWind's bankruptcy, but the demise of SheerWind wasn't unexpected. The Guard had given SheerWind until June of 2017 to deliver on its contractual obligations. General Stone said the Guard's devices "produced some electricity," but not what was promised. Like the Nature Conservancy, Stone did not elaborate on what "some electricity" meant. No decision has been made, Stone said, on whether the devices installed in Michigan would be removed, and if so, how much it would cost to remove them. ScheerWind or its affiliates installed devices in China, Iran, and the Netherlands. There's no word on what will happen to these structures. It's likely that the Netherlands' strong planning regulations will require the owner to remove the device at their own expense. Is SheerWind's demise the end of ducted turbine "development" in the United States. No, it's an idea that springs eternal. Already a company has risen from the ashes of Ogin-FloDesign. More on this unfortunate tale to come. 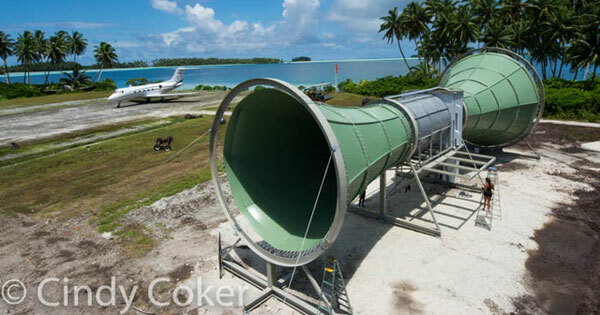 SheerWind INVELOX: The Nature Conservancy's Palmyra Atoll. Amazing!